Business Mobility IP DECT provides users access to the company’s corporate directory. At all times the telephone numbers and names of the entire organization are at hand. Users can also see the presence of the person they need. No need to search for personal contact information or consult the nearest PC screen, just browse to the right person in your DECT handset and check the person’s presence status. 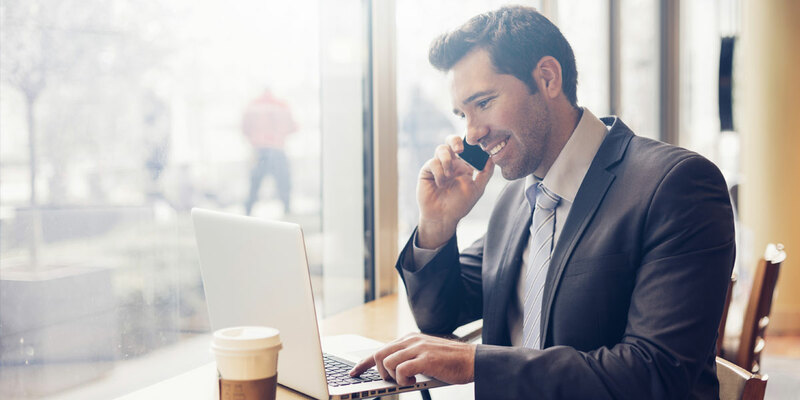 Business Mobility IP DECT provides powerful text and alarm messaging capabilities for a wide variety of applications in different types of business. With messaging, staff can be alerted about incidents such as a fire, nurse calls or status of industrial processes. As such it also replaces separate paging systems. Messaging includes individual messages to terminals, broadcast messages to a group of terminals and confirmation messages by the user. Different priority levels allow staff to differentiate between messages. 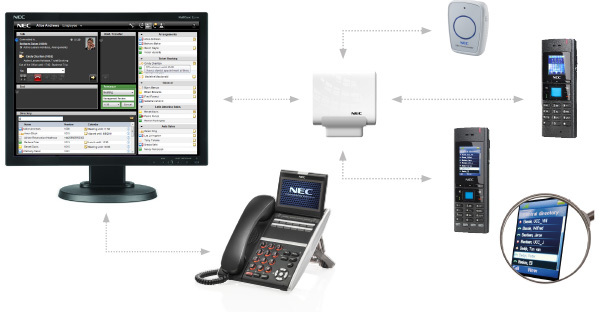 Business Mobility IP DECT can also be used to locate DECT handsets and their users. This can be essential if e.g. staff need immediate assistance from colleagues. Pushing the SOS button on the phone, the system alerts staff to provide assistance, while the system automatically provides the location information. IP DECT offers users Push-to-Talk (PTT) functionality. In this mode pressing the PTT button on the I766 handset results in a group call with One-to-many (Walkie-Talkie) functionality. Multiple groups can be pre-defined. When handsets are in loudspeaker mode, their microphones are muted, while every member can respond by unmuting. 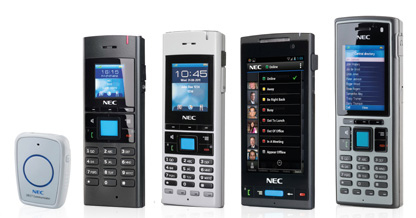 Lone workers are protected by the NEC Lone Worker solution. When getting into a dangerous situation, users can raise an alarm by simply pressing the SOS button or pulling the pull cord from the I766 handset. These alarms are reported to a central alarm panel so that immediate and appropriate help can be provided. The solution complies to the German DIN VDE 0825-1 standard.